Rangers are to charge £5 entry for their Premiership quarter-final play-off against Queen of the South. 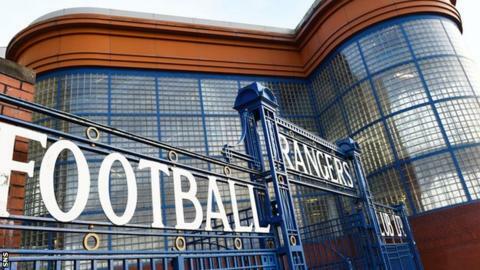 Rangers say charging £5 will allow them to cover the cost of staging the match, which is up to £80,000. "Never at any time did Rangers state it would not adhere to SPFL rules," said the club. The first leg is on Saturday. "And the club believes that setting this flat fee should meet with the approval of all concerned." Motherwell, who could be involved in a play-off if they finish second bottom in the Premiership, had stated their intention to allow season-ticket holders free entry. The example of Hibernian last season was cited, when the Edinburgh club were given special dispensation to allow free entry because they had started selling season tickets before the new SPFL rules were adopted. Each club involved in the play-offs must give the league 50% of their home gate receipts and pay the costs of staging the match from their own portion. Scotland's 42 clubs recently voted against a motion from Hibs, Hearts and Motherwell to reduce that to 25%. "Several pricing structures, including allowing season-ticket holders free admission with other fans paying between £5 and £20, were studied, but it is believed the most favourable option for the club and its supporters is a flat price of £5," said Rangers. "The cost to the club of allowing season-ticket holders free admission would have been substantial after accounting for the levy that would be due to the SPFL. "The £5 ticket price for all will ensure as many supporters as possible can back the team and, should we progress to the next stage of the play-offs, our pricing policy will not change." SFPL rules state that "The home club, in its absolute discretion, shall determine admission charges for league matches and play-off matches". However, it also states that a home club is "prohibited from charging higher admission prices to accommodation designated for supporters of the visiting club than for broadly comparable accommodation designated for use by supporters of the home club at the same match". Rangers, who finished third in the Championship table, travel to Dumfries for the first leg of their quarter-final play-off on Saturday. Queen of the South, who finished fourth, have already announced that they will charge season-ticket holders. The aggregate winners will face Hibernian, who finished second, in another two-leg play-off in a semi-final that leads to a final against the side finishing second bottom of the Premiership.